Opening Program for the exhibit, "Ira's Shakespeare Dream: Original Illustrations by Floyd Cooper"
Ira's Shakespeare Dream is a book for children about Ira Aldridge, the celebrated African American Shakespearean actor. 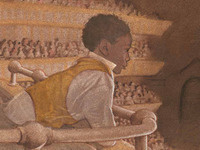 Written by Glenda Armand, the book is illustrated by the award-winning artist Floyd Cooper. Listen to Glenda Armand and Floyd Cooper at this opening reception for the special exhibit of Cooper's illustrations from Ira's Shakespeare Dream. Floyd Cooper talks about his artistic process. Arts at the Pratt is supported by the William G. Baker Memorial Fund, creator of the Baker Artist Portfolios, www.BakerArtist.org.